Here’s a list of fastest times and national and continental records on the Ironman distance. The data is mainly based on my database with results from 2005 onwards, but I have tried to add fast times from before that. Please let me know if I have missed some result or “misplaced” athletes in the wrong country. I am not including results from races with courses that have been acknowledged as short. For example, the bike course of IM Frankfurt 2017 was short by somewhere between 3 and 5k because of construction. IM Texas 2018 has been a fast race that created a lot of controversy whether the times should be accepted as “fastest times” or not. I have decided to include the Texas times in the tables below but “with an asterisk” and also show the fastest time in addition to the Texas time(s). The Texas times are especially apparent in the female bike times: There are nine times from Texas that are faster than the Top 5 from any other races. While I think that most of the Texas results have to be considered invalid, Starky’s 3:54 bike split (the first sub-4 in an Ironman) is the “most legit” result of the day – even if the course was slightly short there is very little chance to draft while riding at the front of the field and no motos on the course. During her career, Paula Newby-Fraser has been racing for Zimbabwe and the USA and it’s a bit hard to assign her to one country or continent, but she is listed in the Roth 1994 results as racing for Zimbabwe. If you don’t want to count Paula for Africa, then the fastest time has been posted by Annah Watkinson (9:04:59 at IM Brasil 2017). As suggested by the IMTalk hosts John Newsom and Bevan James Eyles, here are some more details for a few nations and their fastest athletes in Kona. If you included IM Texas 2018, Matt Hanson would still be the fastest athlete (he posted a 7:39:25), followed by Andrew Starykowicz (7:50:56). Her fast time at IM Texas 2018 would put Jodie Robertson (08:43:16) in third place. With his 7:47:43 from Texas 2018, Tim Van Berkel would be the Australian record holder. When including Texas 2018, Mel Hauschildt would have the fastest Australian time with her 8:31:05. Peter also won IM Austria in 1999 in 7:51:56, but he himself acknowledges that the run course was short by a few k, posting a 2:35 run split. Counting IM Texas, Jen Annett would take over the #1 spot with her 08:49:27 finish. 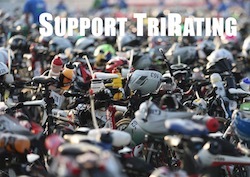 John Levison from Tri247.com has a lot more data on the British athletes overall and in Kona. Will Clarke’s Texas 2018 result (07:45:22) would see him climb into second place.